Snapchat is stepping into the gaming world. 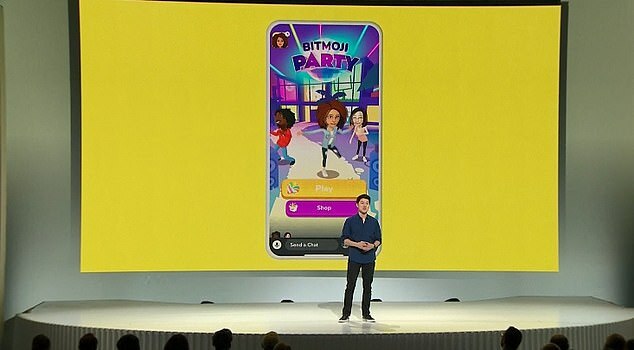 The social media platform took the wraps off of its long-awaited gaming platform, Snap Games, at the first-ever Snap Partner Summit in Santa Monica, California on Thursday. Also at the event Snapchat debuted new augmented reality lenses, including one that lets users superimpose interactive graphics onto real-world landmarks, as well as an updated slate of original shows and new tools for advertisers. Users can now play live multiplayer games against their friends by clicking on the rocket ship icon in the Chat bar on the app. As part of the launch of Snap Games, which is available for all users globally starting today, the firm rolled out six games that are only available on Snapchat. One of its headline titles ‘Bitmoji Party’ transforms users and their friends into cartoon avatar versions of themselves in a series of ‘quick, wacky mini-games,’ Snapchat said. The other titles include ‘Alphabear Hustle,’ ‘Crash Arena Turbo Stars Drift Race,’ ‘Snake Squad,’ ‘Zombie Rescue Squad’ and ‘Tiny Royale,’ which is developed by Zynga, the company behind many popular mobile games like Words With Friends and Farmville.